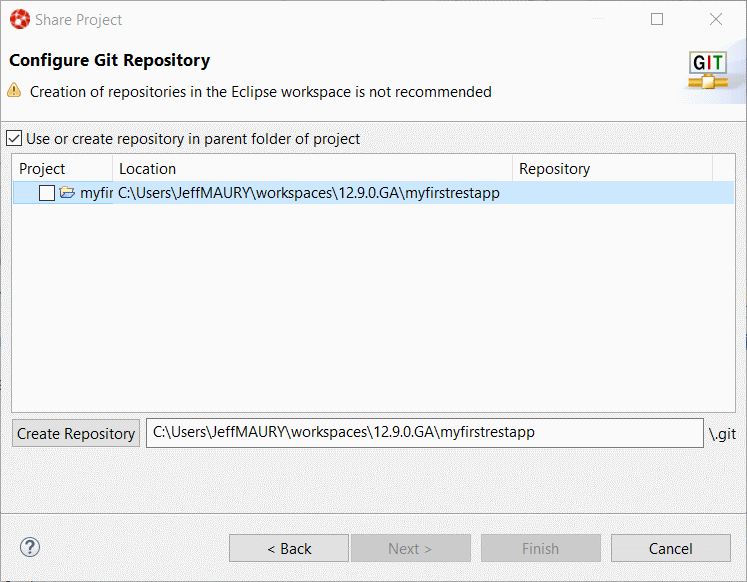 Attention desktop IDE users: Red Hat Developer Studio 12.9 and the community edition, JBoss Tools 4.9.0 for Eclipse 2018-09, are now available. 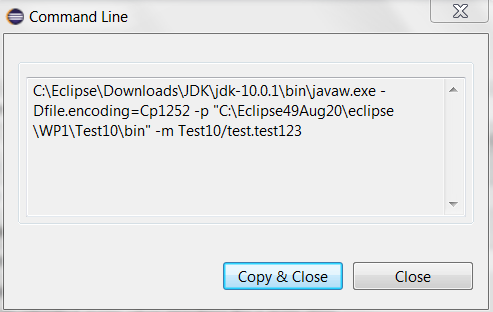 You can download the Developer Studio bundled installer, which installs Eclipse 4.9 with all of the JBoss Tools already configured. Or, if you have an existing Eclipse 4.9 (2018-09) installation, you can download the JBoss Tools package. 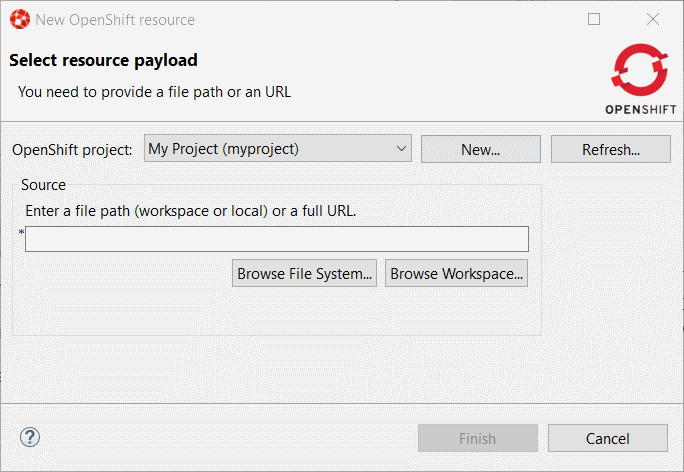 This article highlights some of the new features in both JBoss Tools and Eclipse Photon, covering WildFly, Spring Boot, Camel, Maven, and many Java-related improvements—including full Java 11 support. 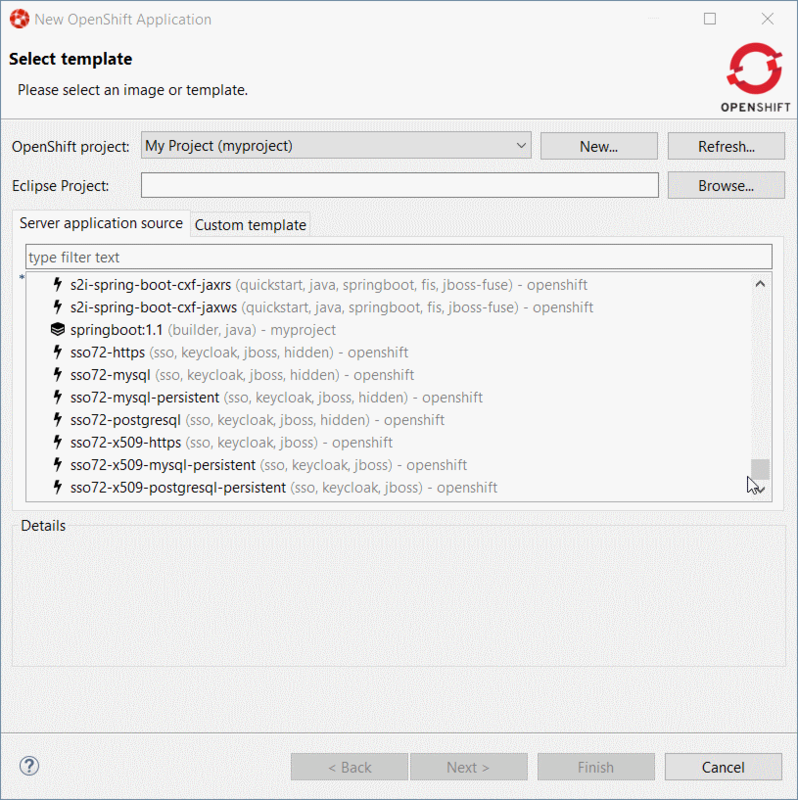 Developer Studio/JBoss Tools provides a desktop IDE with a broad set of tooling covering multiple programming models and frameworks. If you are doing container/cloud development, there is integrated functionality for working with Red Hat OpenShift, Kubernetes, Red Hat Container Development Kit, and Red Hat OpenShift Application Runtimes. For integration projects, there is tooling covering Camel and Red Hat Fuse that can be used in both local and cloud deployments. 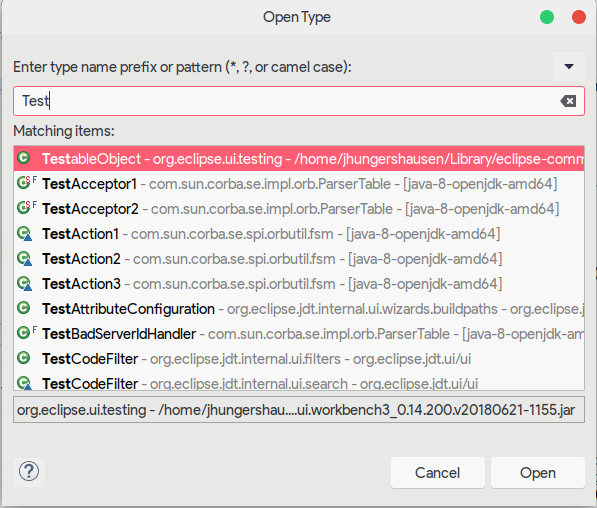 JBoss Tools, which is also known as the Bring-Your-Own-Eclipse (BYOE) option, requires at least Eclipse 4.9 (2018-09), but we recommend using the latest Eclipse 4.9 2018-09 JEE Bundle because then you will get most of the dependencies preinstalled. 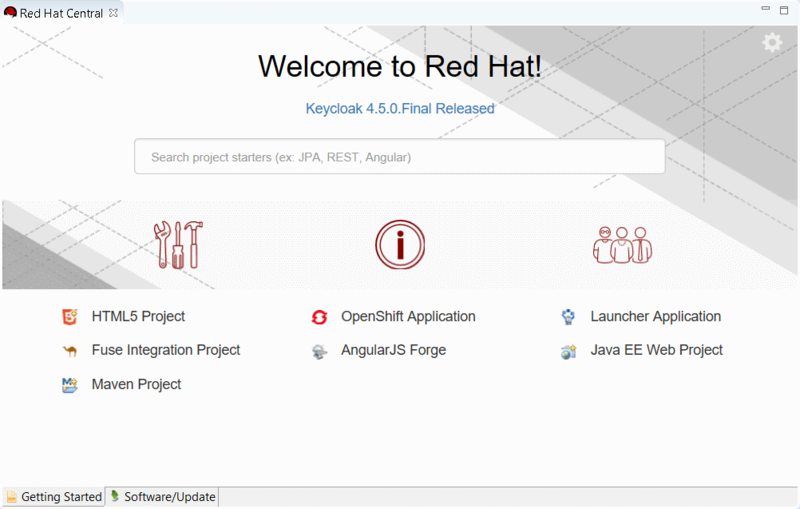 Once you have installed Eclipse, you can either find us in the Eclipse Marketplace under JBoss Tools or Red Hat Developer Studio. Our main focus for this release was on the adoption of Java 11, improvements for container-based development, and bug fixing. Eclipse 2018-09 itself has a lot of new cool stuff, but let me highlight just a few updates in both Eclipse 2018-09 and JBoss Tools plugins that I think are worth mentioning. 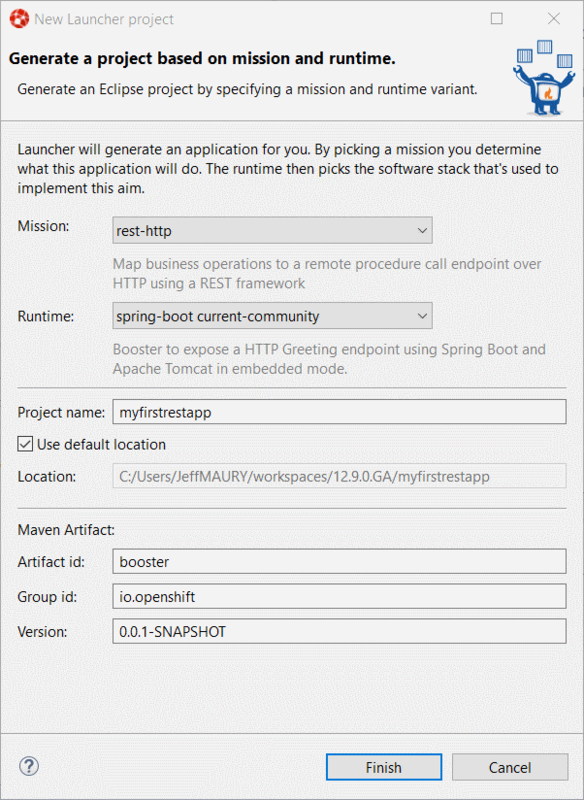 Although Spring Boot applications were already supported by the OpenShift server adapter, the global developer experience has been enhanced. Let’s look at the full workflow. 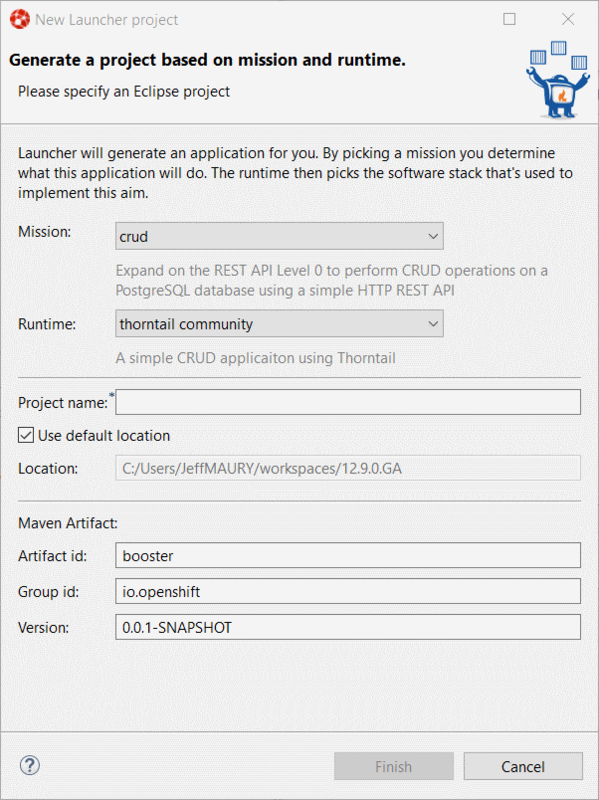 Set the Mission field to rest-http because we want to generate a simple REST application, and set the Runtime field to spring-boot current-community because we want to generate a Spring Boot–based application. 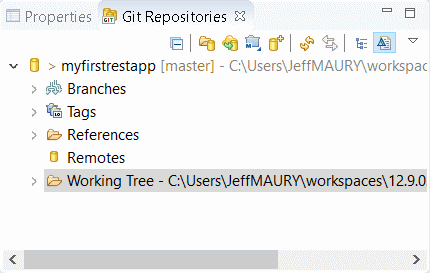 Then set the Project name field to myfirstrestapp and leave the other fields as-is. Click the Finish button. A new project will be added to your local workspace. 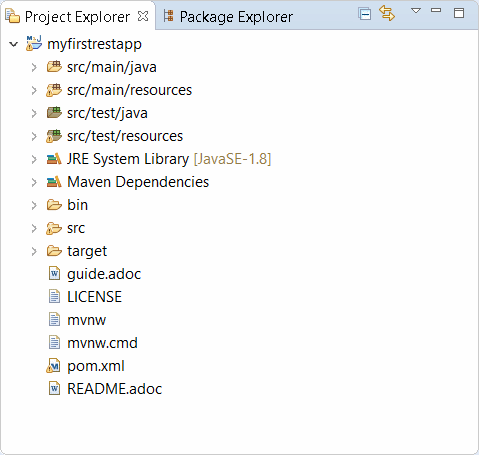 It may take some time because Maven will resolve all the Spring Boot dependencies and, thus, need to download them from the Internet. Because OpenShift builder images retrieve code on a Git repository, we first need to push the just-generated application code to GitHub. The following section assumes that you created a repository called myfirstrestapp under your GitHub account. 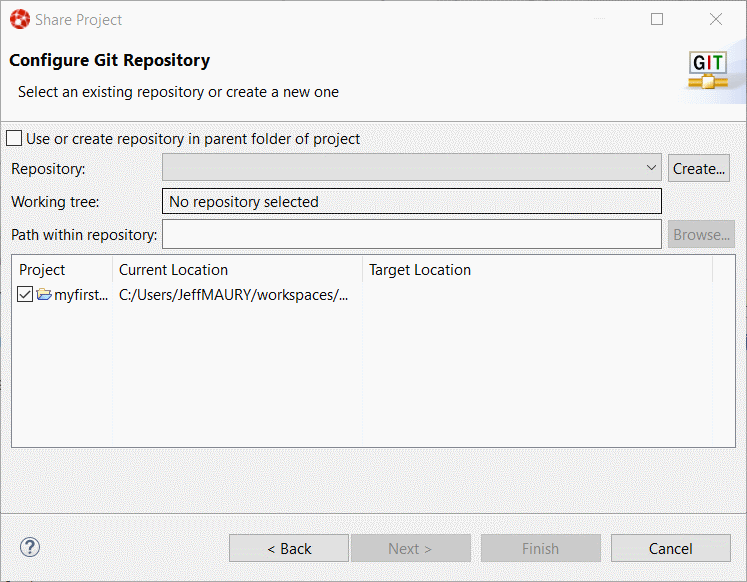 We will first create a local Git repository for our application code and then push the code to GitHub. 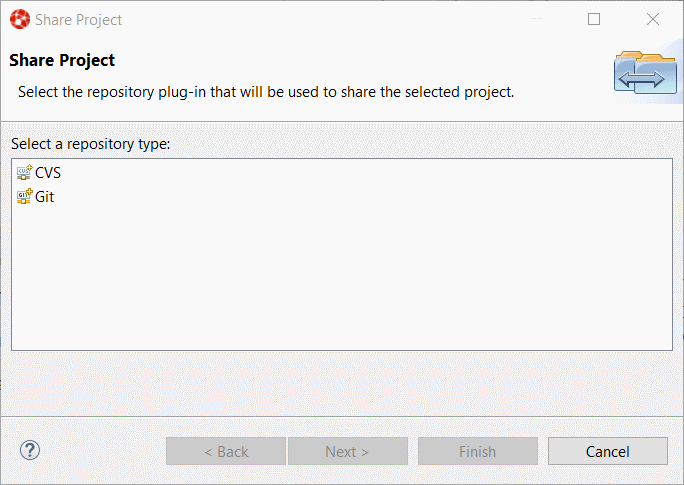 Click on the Create repository button and then the Finish button. 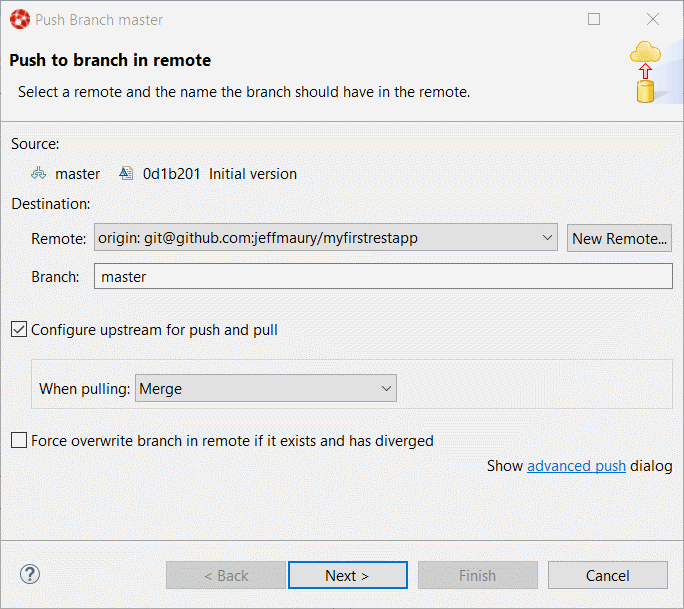 Click on the Change button and enter git@github.com:GITHUB_USER/myfirstrestapp in the URI field, replacing GITHUB_USER with your real GitH username. Then click the Finish button and then the Save button. Click on the Finish button to start the push operation. 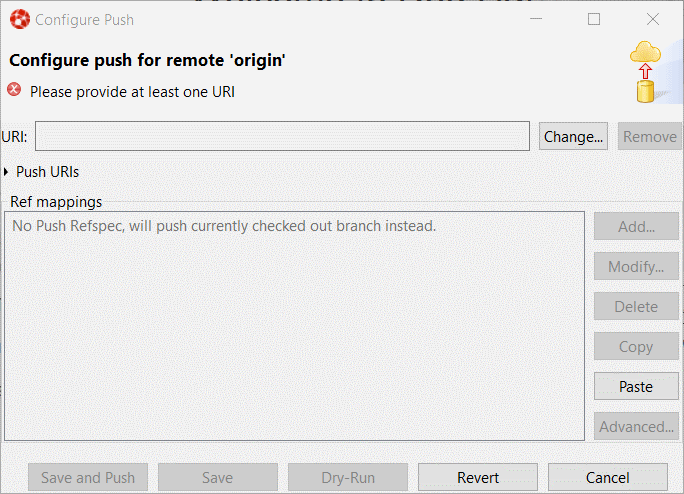 A dialog box with the result of the push operation will be displayed. Click OK to dismiss it. 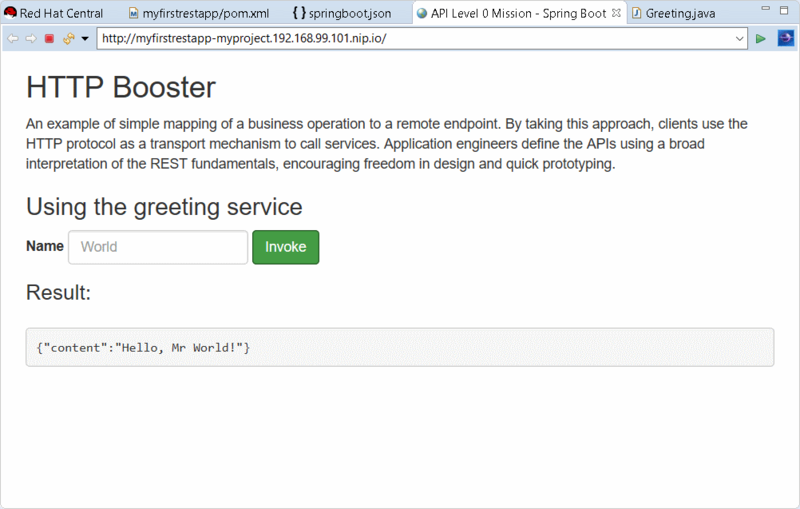 In order to support live update on an OpenShift cluster, we must add Spring Boot DevTools to our Spring Boot application. Close and save the pom.xml file. 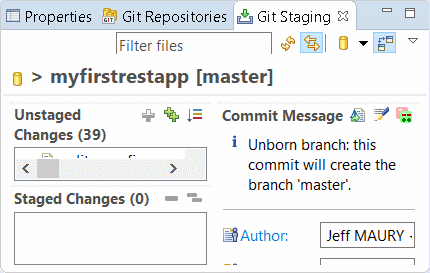 Push the change to GitHub: select Team -> Commit with a new commit message (for example, “With DevTools”). 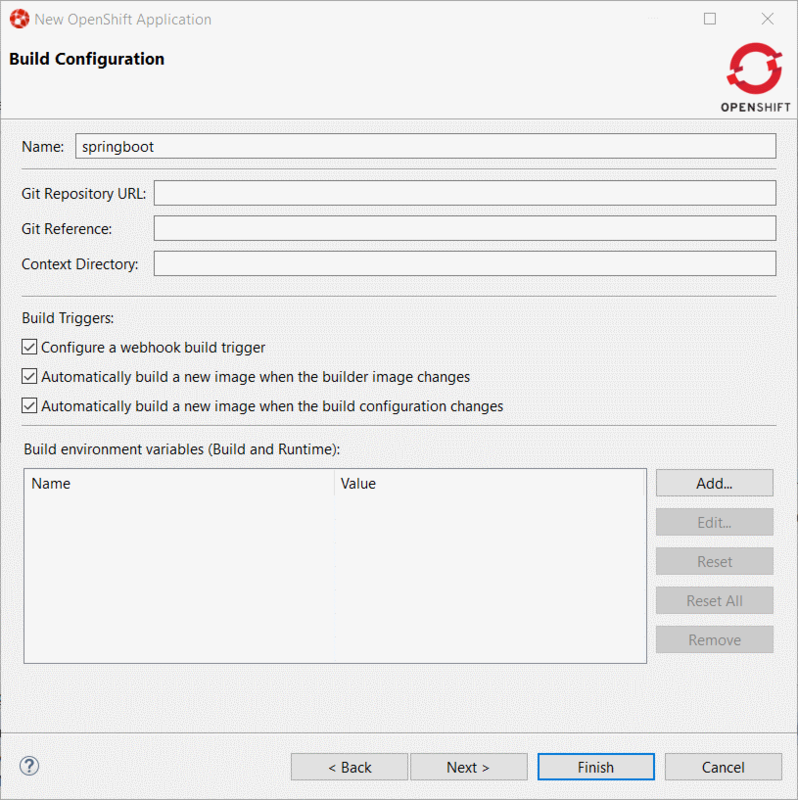 Before we can deploy the application on OpenShift, we must first create an ImageStream on our OpenShift cluster. 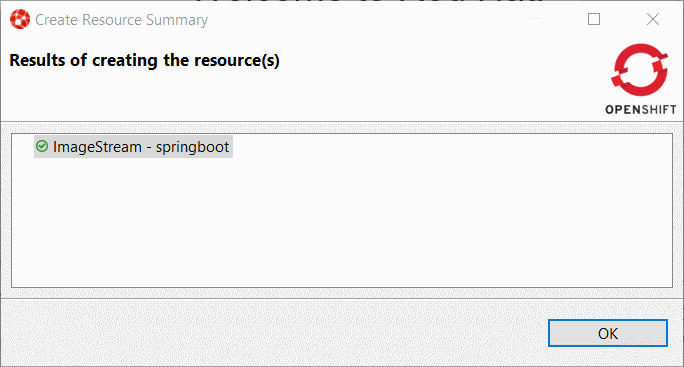 The reason is that the Spring Boot support relies on S2I builds that will explode the Spring Boot uber JAR when Spring Boot DevTools is present. Because this is not supported by Java-based S2I images, we will use one that supports it, that is, fabric8/s2i-java:2.2. 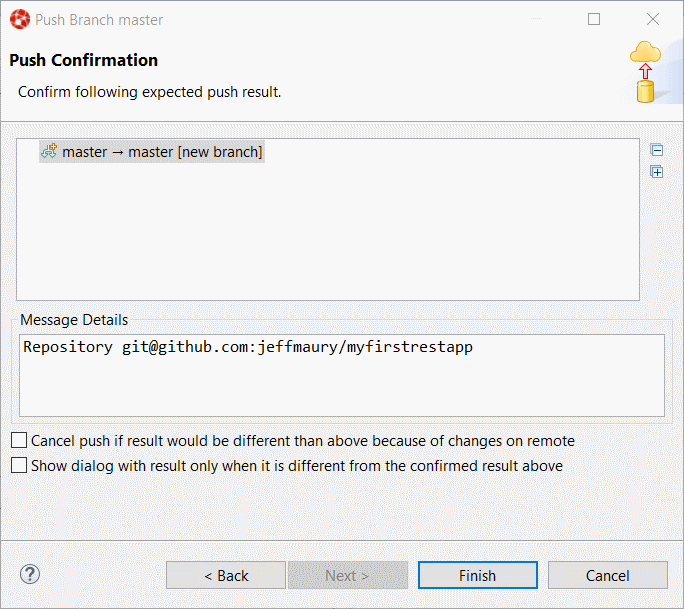 Enter myfirstrestapp in the Name field, enter https://github.com/GITHUB_USER/myfirstrestapp in the Git Repository URL field, replace GITHUB_USER by your real GitHub username, and click the Next button. In the Deployment Configuration & Scalability dialog box, click the Next button. Click the OK button then the Finish button. Click the OK button to dismiss the dialog box and when asked to import the application code, click the Cancel button because we already have the source code. We are going to synchronize the local Eclipse project with the remote OpenShift pod. Each time a file is modified locally, the pod will be updated accordingly. We’ve not set up the synchronization between our local Eclipse project and the remote OpenShift project. Each modification done locally will be reported on the remote OpenShift cluster. 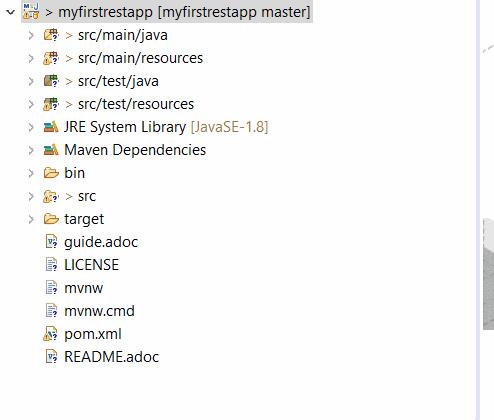 Edit the file src/main/java/io/openshift/booster/service/Greeting.java in the myfirstrestapp project and change the FORMATstring value from Hello, %s! to Hello, Mr %s! and then save the file. * Copyright 2016-2017 Red Hat, Inc, and individual contributors. 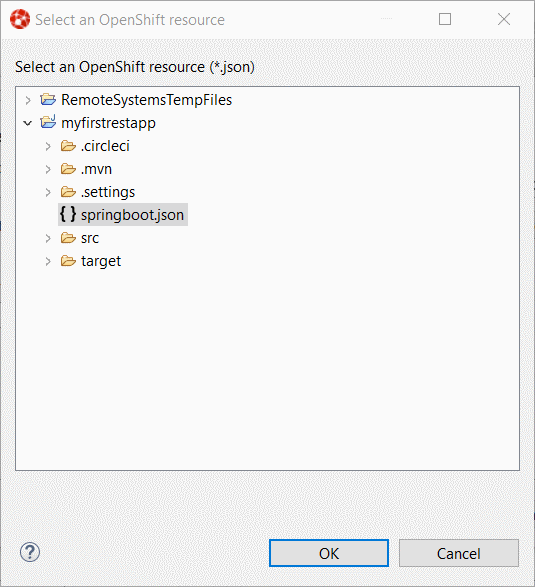 You’ve just experienced the inner loop on your Spring Boot application: any change done locally is reported and testable almost immediately on your OpenShift cluster. You can restart the deployment in debug mode and you’ll be able to remote debug your Spring Boot application. Amazing, no ? 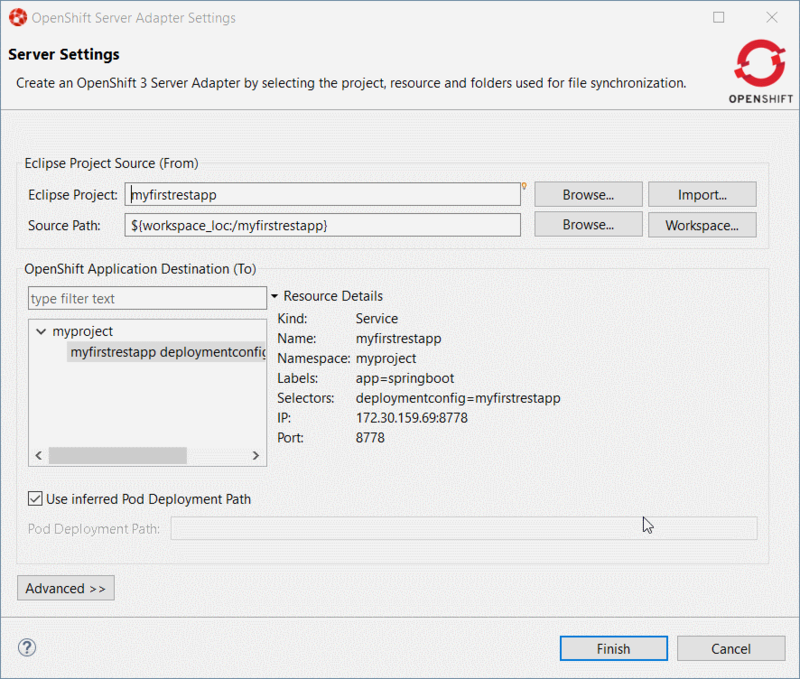 A server adapter has been added to work with Wildfly 14. It adds support for Java EE 8. The Hibernate 5.3 runtime provider now incorporates Hibernate Core version 5.3.6.Final and Hibernate Tools version 5.3.6.Final. The Hibernate 5.2 runtime provider now incorporates Hibernate Core version 5.2.17.Final and Hibernate Tools version 5.2.11.Final. The Hibernate 5.1 runtime provider now incorporates Hibernate Core version 5.1.16.Final and Hibernate Tools version 5.1.10.Final. Previously, there was a REST editor which was read-only. It is useful to have a great overview of already defined Camel REST DSL definitions. Now the editor and its related properties tab are also providing editing capabilities allowing to develop faster. In addition, we’ve improved the look and feel by fixing the scrolling capabilities of the REST Element and REST Operations lists. The Breadcrumb in the Java Editor now uses a dark background in the Dark theme. 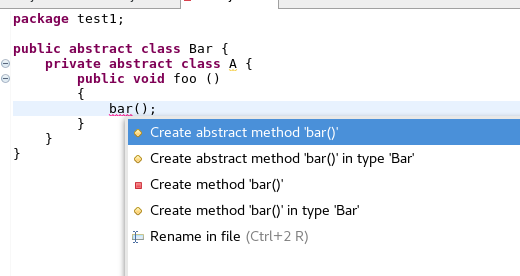 The existing quick fix to create missing methods has been improved to create abstract method declarations. The option only appears when the target class is an abstract class. 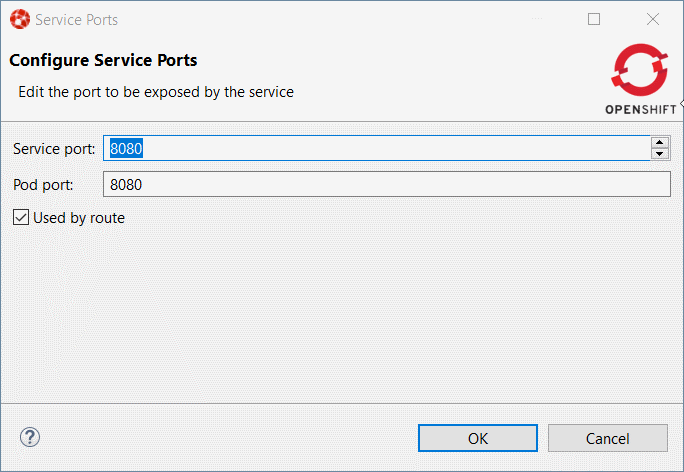 A new quick fix has been implemented that allows the user to convert static field accesses and static methods to use a static import. It’s also possible to replace all occurrences at the same time. 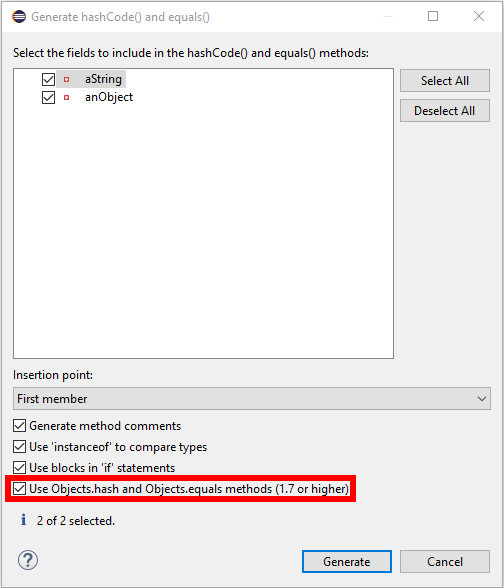 A new option in the Source > Generate hashCode() and equals()… tool allows you to create implementations using the Java 7 Objects.equals and Objects.hash methods. Additionally, arrays are handled more cleverly. 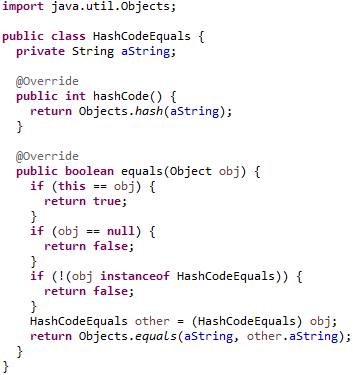 The generation prefers the Arrays.deepHashCode and Arrays.deepEquals methods when dealing with Object, Serializable, and Cloneable or any type variables extending these types. 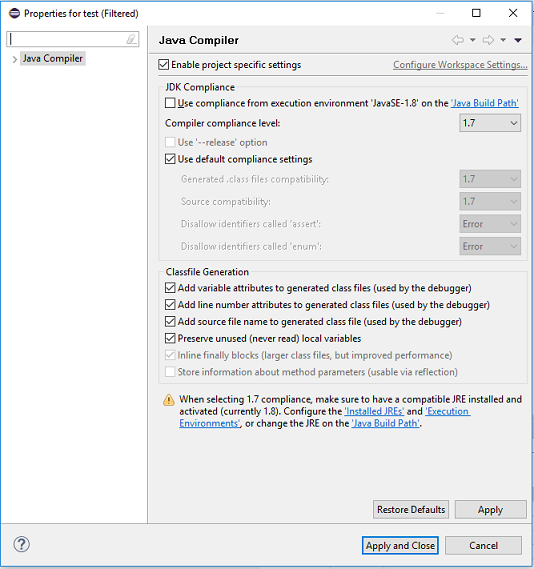 A new quick fix is provided on the JRE Compiler Compliance problem marker, which is created when the compiler compliance does not match the JRE being used. 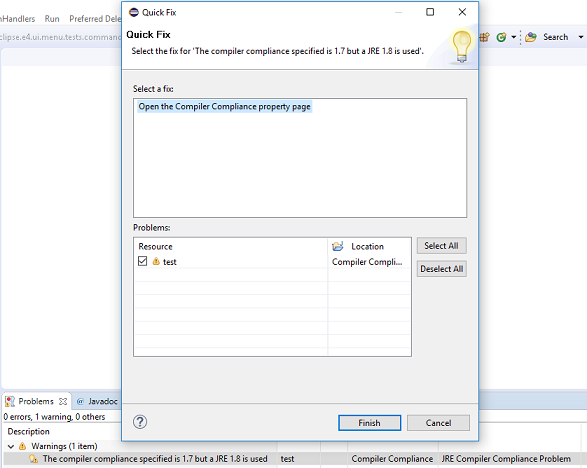 This quick fix provides the option of opening the Compiler Compliance page of the project to fix the issue. The Open Type dialog box now always shows the full path of all the matching items. 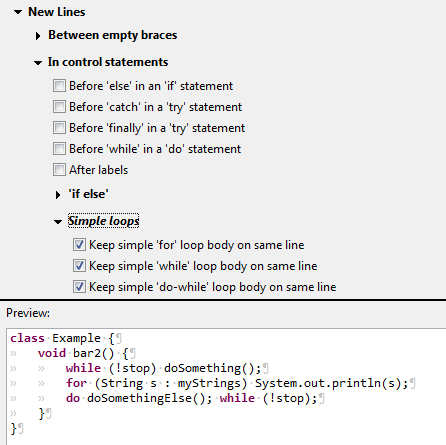 New formatter settings have been added that make it possible to keep the bodies of simple loops (without braces) in the same line as their headers, similar to the previously existing setting for simple if statements. Different kind of loops (for, while, do while) can be controlled independently. There’s also a new setting to control how these loops should be handled if they exceed the maximum line width. It’s located under Line Wrapping > Wrapping settings > Statements > Compact loops (‘for’, ‘while’, ‘do while’). 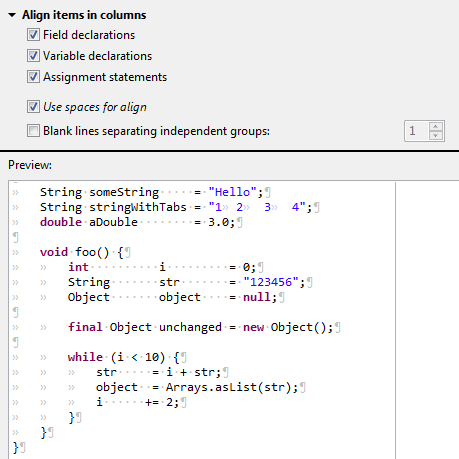 A feature previously known as align fields in columns has been expanded and can now be used for variable declarations and assignment statements as well. An option has also been added to always align with spaces, even if tabs are used for general indentation. This is very similar to the Use spaces to indent wrapped lines option and is useful to make the code look good in editors with differing tab widths. Observing the result of step operations may slow down execution, which may make trying to observe results unusable if a step takes long already. Therefore, a timeout (default is 7000 ms) has been introduced after which the observation mechanism is disabled until the end of the step operation. 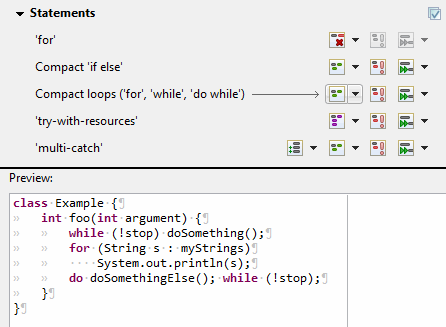 The timeout can be configured in Preferences > Java > Debug > Don’t show if step operation takes longer than (ms). A new option has been introduced in the Debug view to show or hide running threads. Hiding running threads can be useful when debugging a heavily multithreaded application when it is difficult to find threads stopped at breakpoints among hundreds or thousands of running threads. 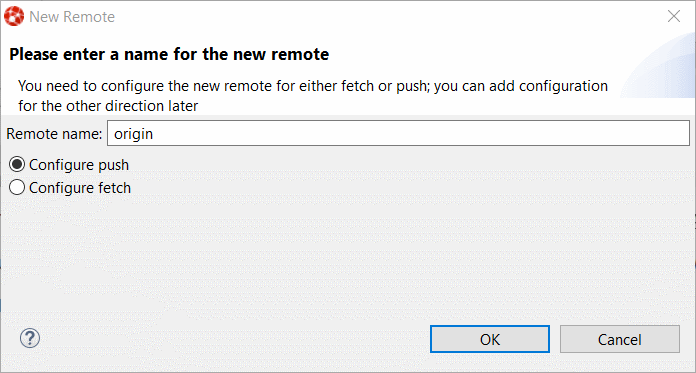 A new Show Command Line button has been added in the Java Launch Configuration dialog box. Clicking the button will open a dialog box to show the command line used for launching the application. 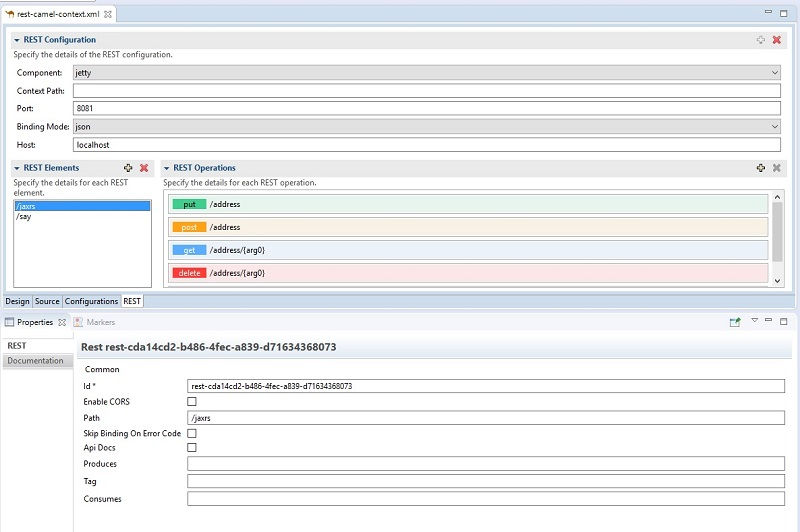 Thread name changes in the JVM being debugged are reflected in the Debug view. A VM option can now be used to disable this behavior in case the JVM communication necessary for the name updates is not desired. The classpath and/or modulepath are now shortened if they are longer than current operating system limits. 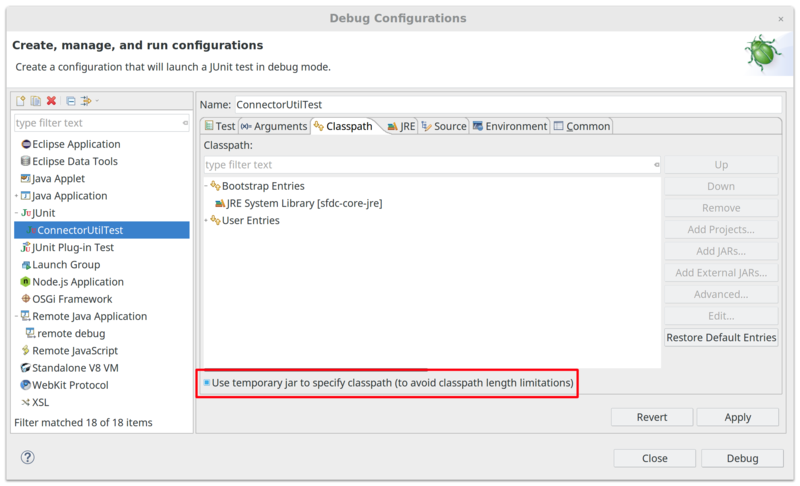 If a temporary JAR is needed to shorten the classpath (Java 8 and previous versions), a dialog box is shown asking for confirmation. 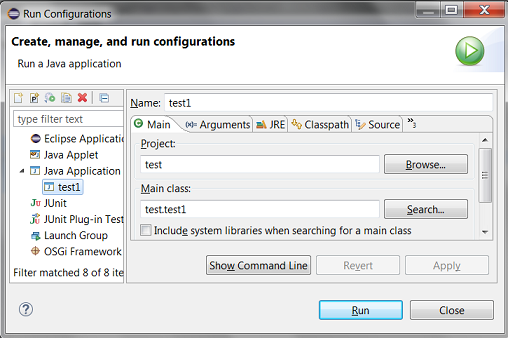 The option Use temporary jar to specify classpath (to avoid classpath length limitations) is available in the Classpath tab of the Run/Debug Configuration dialog box. Now that JBoss Tools 4.9.0 and Red Hat Developer Studio 12.9 are out, we are already working on the next release for Eclipse 2018-12.